There are all kinds of relationships out there, and it really depends what the partners’ characters are. For example, a lazy person with no life goals would probably not feel comfortable with an active partner who is also an overachiever. Well, it would be unlikely for such a relationship to begin in the first place. When you think about it, the reasons for a relationship to become unstable are endless! The list below is full of suggestions about how that happens. We believe that people are often too close to causing their relationship to end. We guess that people prefer different ways of making sure that their partners stay faithful. Sometimes this just does not happen as they planned it. 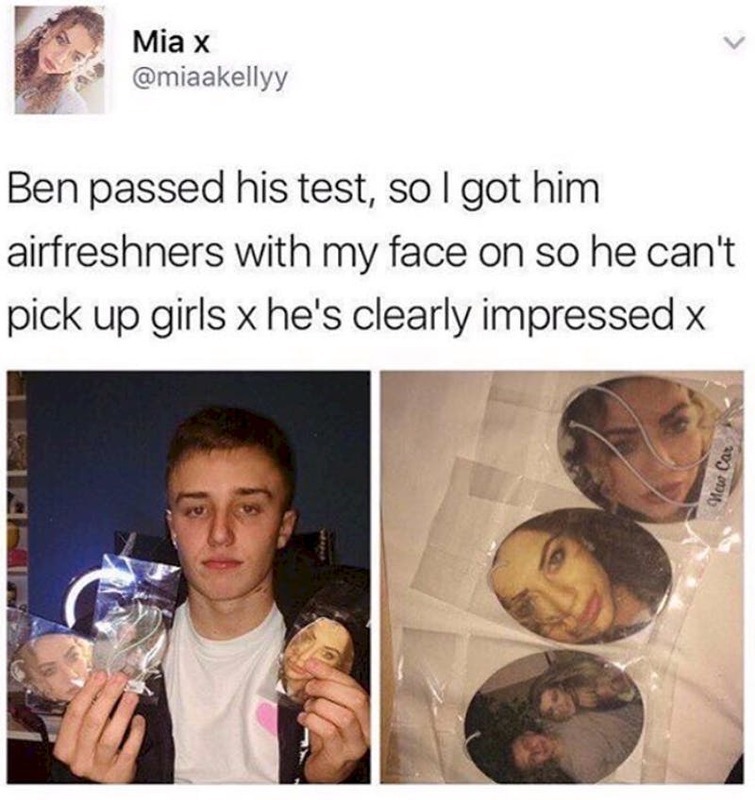 This girl decided to give her boyfriend a set of custom-made air fresheners for his car as a gift for passing an important test. Her intention was to keep him by making sure that any girl who gets in his car would see her face. It is clear to see that the boyfriend is not so happy about the gift! 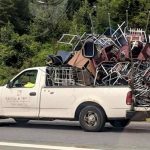 Maybe all of this was nothing but a prank! There are a lot of ways to teach your partner a lesson or to make them behave in a certain way, but being rude to them or just pulling their leg is not among those ways! This is what one person did. 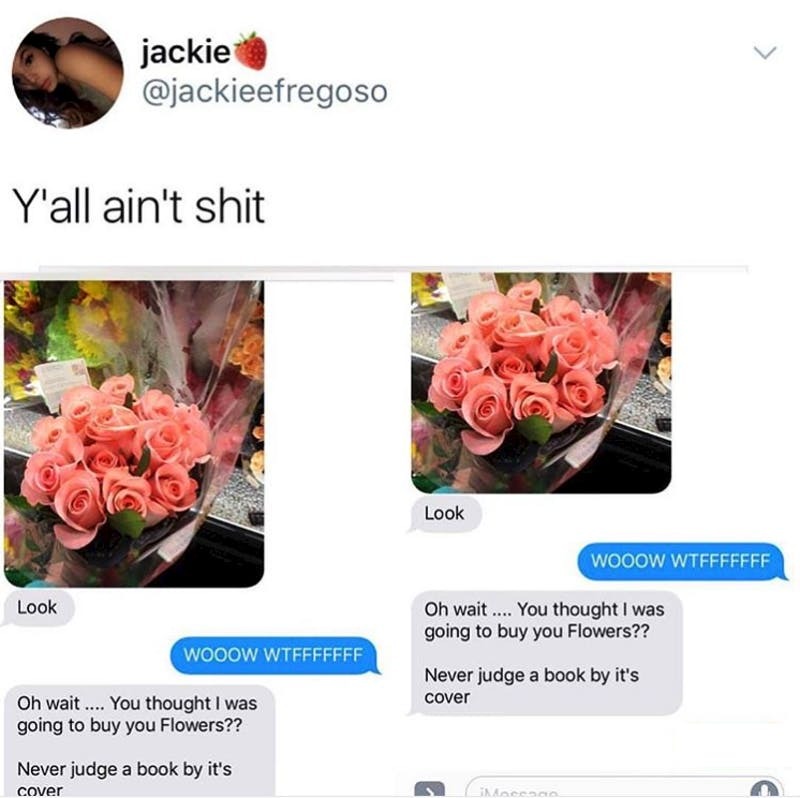 He sent his girlfriend a photo of a beautiful bouquet and as any girl would assume, she thought that it was for her and she reacted all excited. But then her boyfriend poured a cold shower over her, and we have no idea what he intended to do with this move. Sometimes you just know that everything is doomed since the very start. The situation you see here is definitely the best example we can show to demonstrate what that looks like. 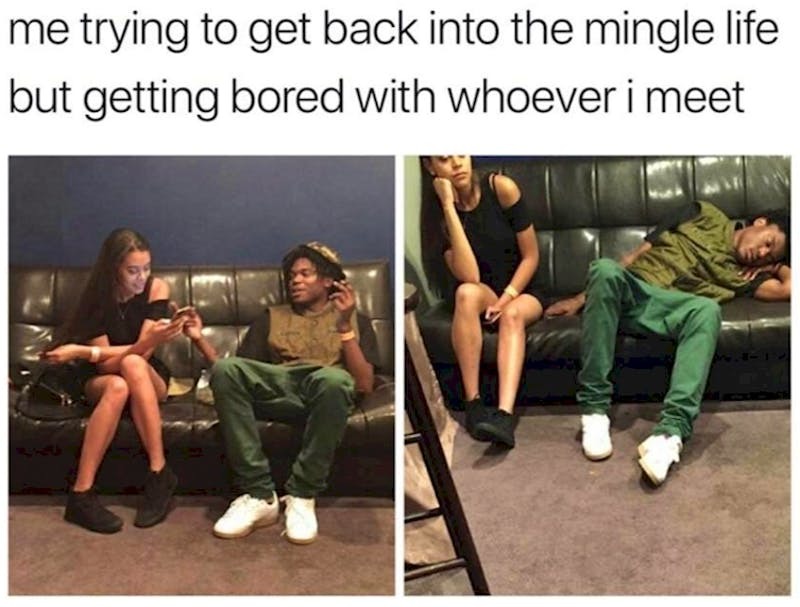 These two people tried to have some kind of conversation to get the party started and to get to know each other, but it is easy to see that they were not able to get things going in the right direction. The boy even fell asleep, and we guess that it doesn’t get worse than that! We believe that everyone is at least a bit jealous and we all know how jealousy reflects on a relationship – it could actually destroy it without an obvious reason. 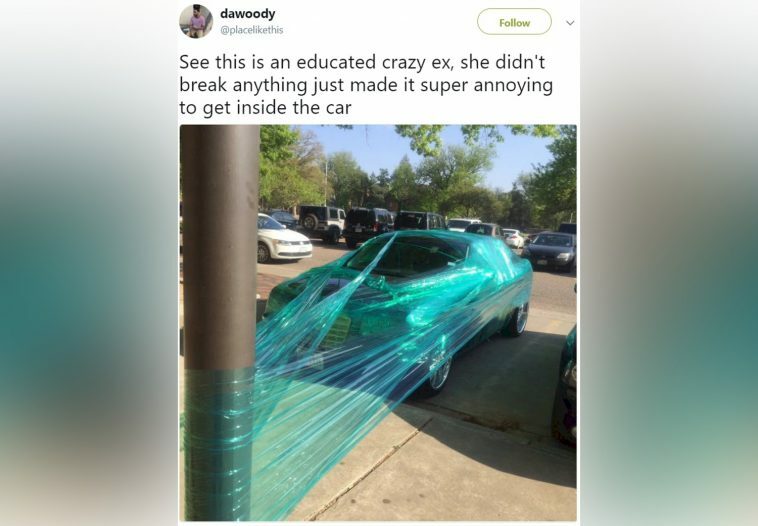 As you can see here, someone’s girlfriend decided to make sure that he stayed faithful and she had very weird way of doing that. She actually replaced the screensaver and the desktop of his phone with two very special images of her. This is just not right, and we guess that this is not a funny joke. It is no secret that many people are overprotective of their partners, but sometimes things seem to be a bit controversial. 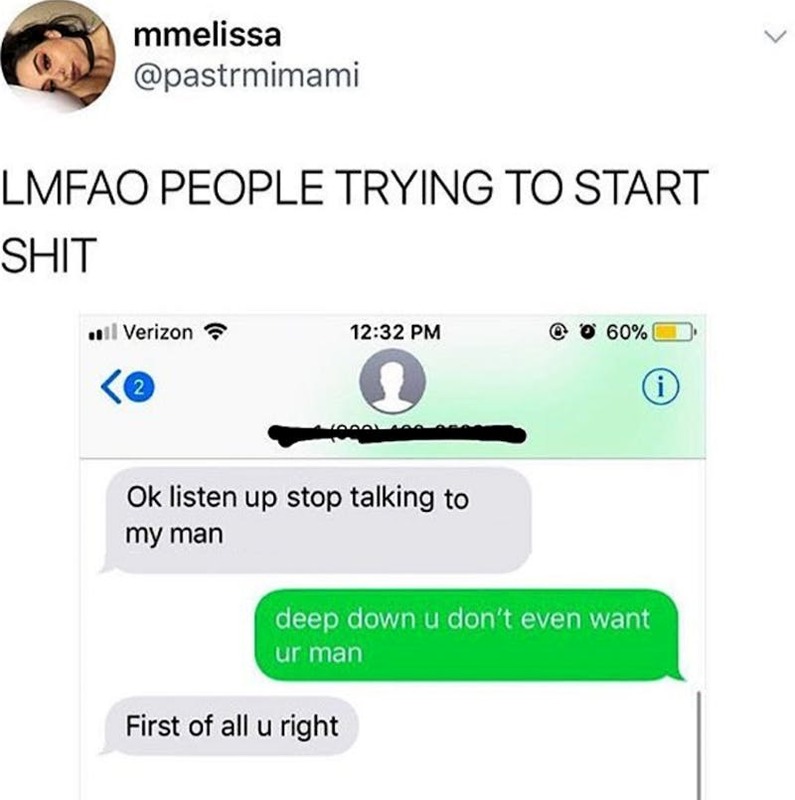 As you can see, some girl started messaging another person and she seemed frustrated about the potential conversation between that person and her man. The unexpected reply she received probably made her think about it and she immediately switched her position about the relationship. We can see the end of it coming. We believe that some relationships are literally shaken from their foundations because one or both partners do not trust each other. While in most cases things look harmless, in other situations you can literally sense that things are just wrong. This short conversation shows that one girlfriend definitely has trust issues. 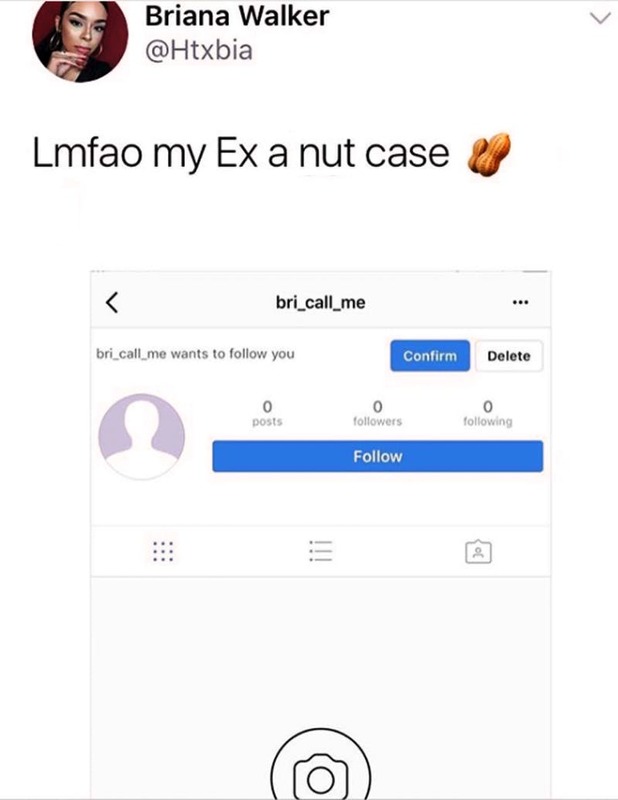 Even when her man sent her the photo she needed as a proof, she still had something to say. 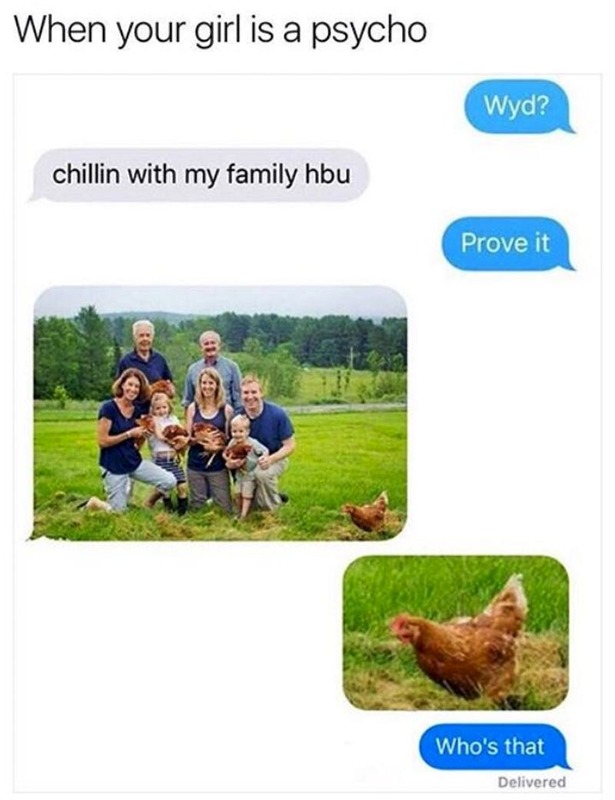 Imagine if that chicken was a person! We live in really interesting times. The way most of us live has changed a lot in the last 15 or 20 years, and technology is responsible for that. In one way it made our lives easier, but in other cases it really made things tougher! We believe that some people are obsessed with the idea that their partner must be cheating on them, and this is not healthy for their relationships! 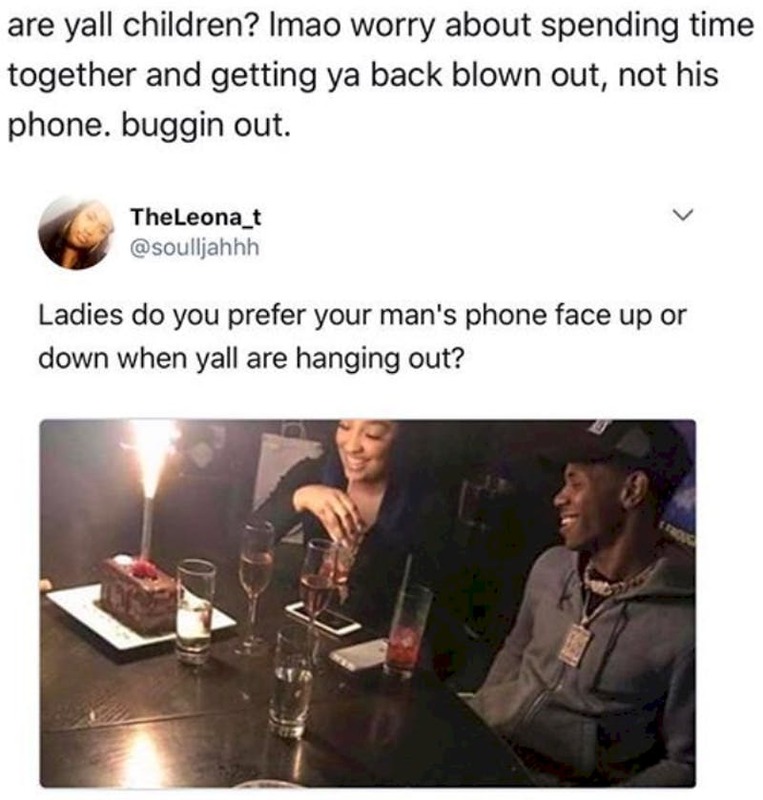 As someone pointed out here, there are more important things than the direction your partner’s phone faces. 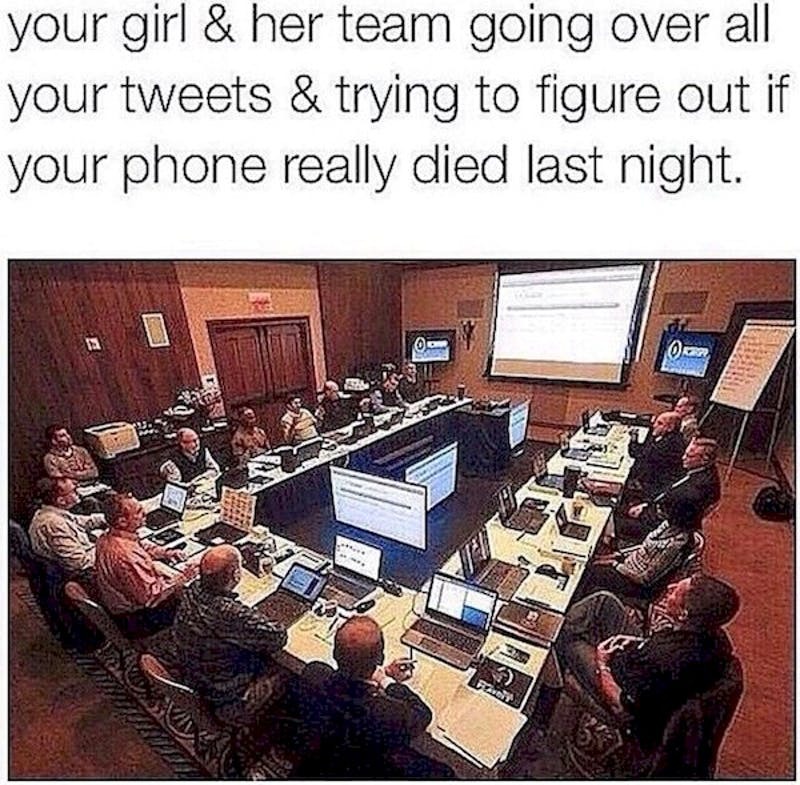 This is probably a man’s worst nightmare! It seems that Austin saw an amazing opportunity to win this person’s heart, and he did his best! 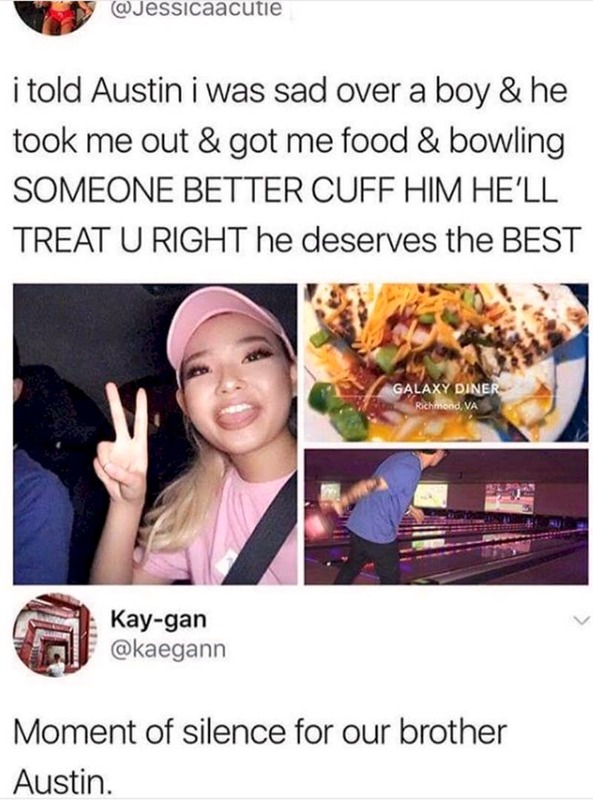 He took her to eat and then they went to have a good time playing bowling. However, it did not work out well. She was clearly impressed by the way he treated her, but her post tells us that he is not getting special attention from her. At least he tried, but Austin would not get to first base with this girl. It is no secret that if you want to have a healthy and long-lasting relationship, you need to keep a good relationship with your girlfriend’s best friends! You can be sure that most of the time she spends with them you will be the main topic! They would analyze everything you do and this is especially true when it comes to your behavior on social media! You need to keep things real and tell your girls everything that happens as it is. We believe that some relationships are so complicated that they are borderline impossible! This conversation here suggests that the thing that is going on between these people is like it was a part of a soap opera! 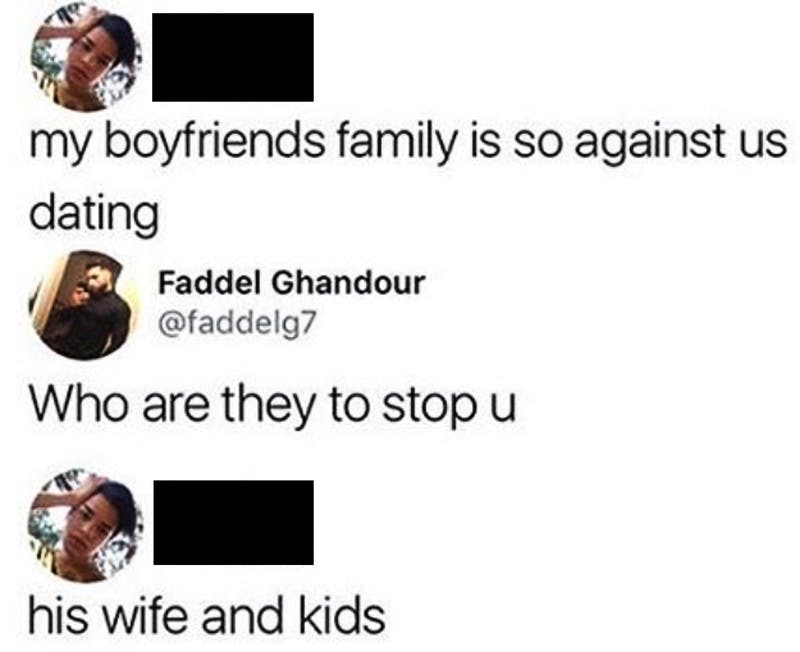 These people are considering a relationship while the girl is dating a married man! This is a lot more advanced than just a plain old love triangle. It seems that people are able to take being unfaithful to new heights and the level of complication here is insane. It is really sad to see how love ends, but it happens all the time and probably the majority of people have experienced this kind of thing. Unfortunately, in many cases people cannot let go, and this is what happened here. 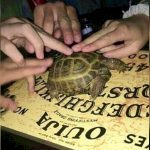 After this girl decided to break up with her boyfriend, he found it hard to accept and tried all kinds of ways to contact her. As you can see, he even created a new Instagram account named in the most ridiculous way. This person definitely got this wrong! 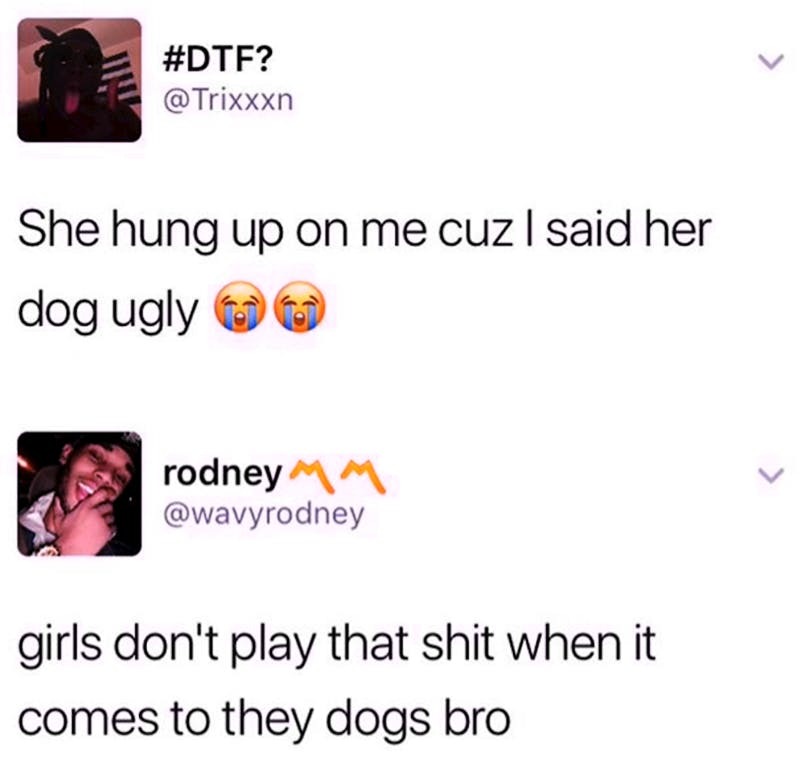 Calling a person’s dog ‘ugly’ is not nice at all. If that person happens to be the person of interest to you, this is one of the biggest mistakes you could make! 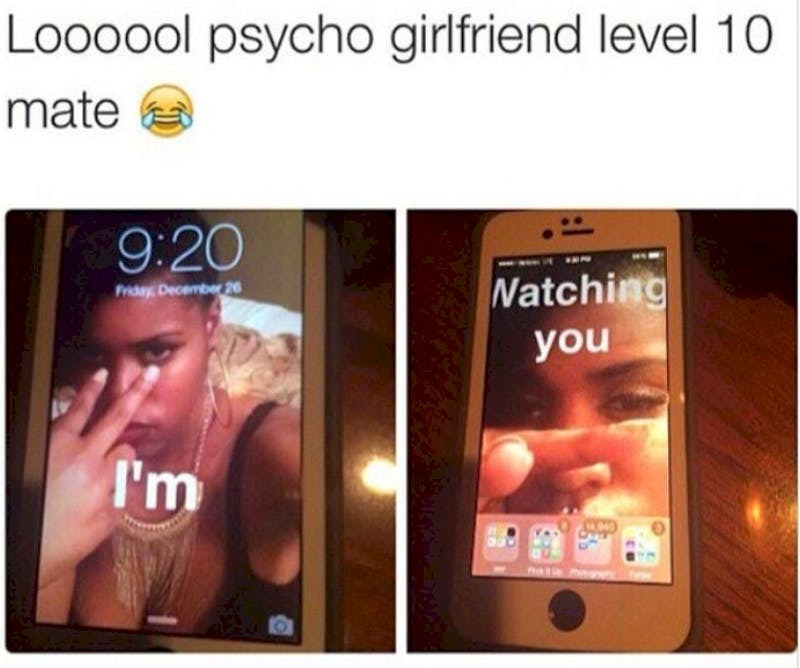 We cannot believe that this person actually wondered why the girl hung up the phone. Well, we cannot imagine that a girl would not do the same! We mean, calling a dog ‘ugly’ is a huge no-no! We really believe that this happens more than often! In a certain point of any relationship men get to know their girls for who they are, and sometimes they discover that girls are not that humble and sweet as men thought they were initially. 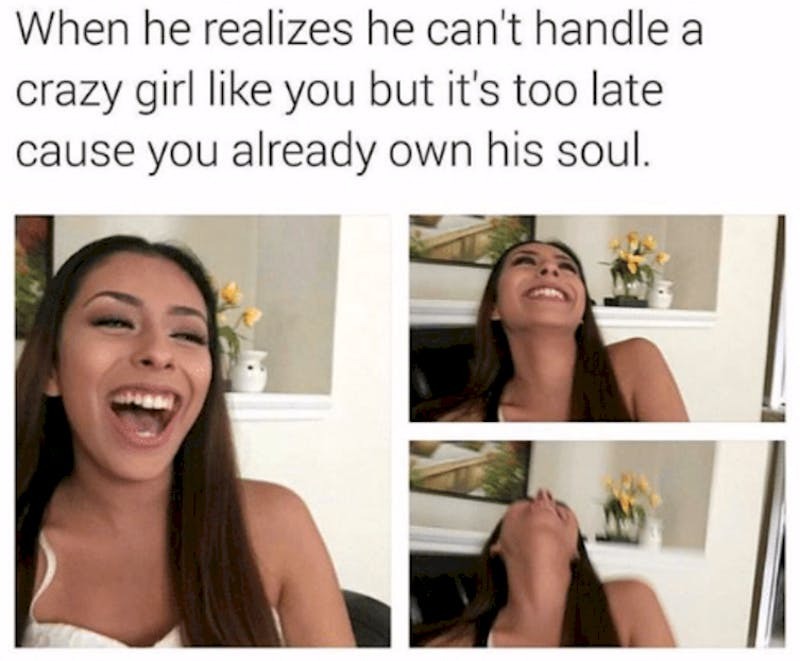 On the other hand, girls seem to know that this would happen soon or later but they are also aware that by this time men would have fallen for them on a deep level! This is exactly what we meant when we mentioned about the power of social media and technology over people’s relationships. Unfortunately, this is not a good influence in the majority of cases, because it gives jealous people a reason to fight with their partners. This often ends in a disaster, and for good reason. 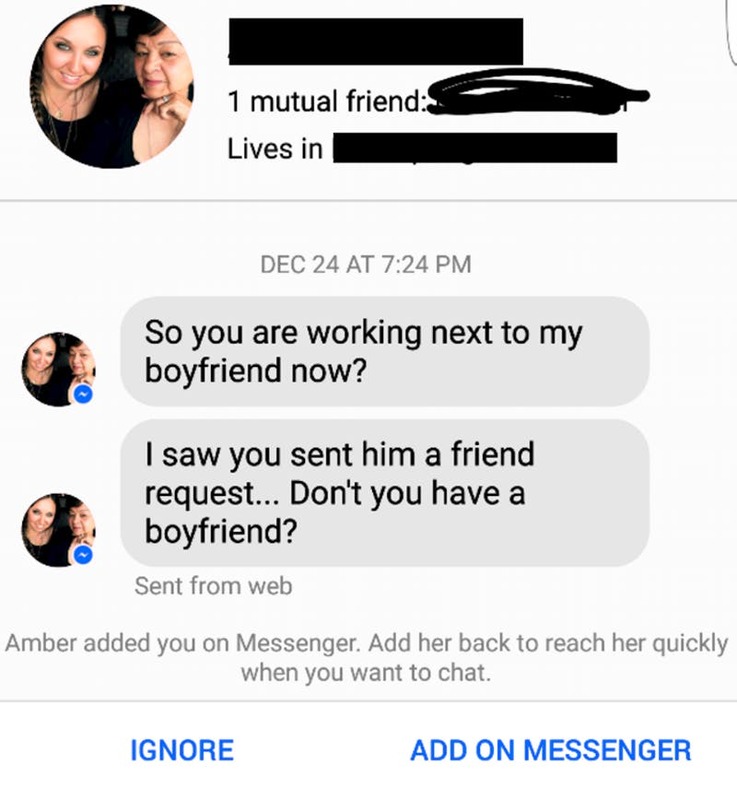 As you can see, a jealous girlfriend found out that a female coworker of her boyfriend sent him a friend request and immediately wrote her, and we can tell by the way she initiated the conversation that she was furious and ready to fight. We believe that this image needs no caption, but we will try to make a comment about it anyway! When you see the boy’s face, you can immediately relate to the way he felt when he received this gift. 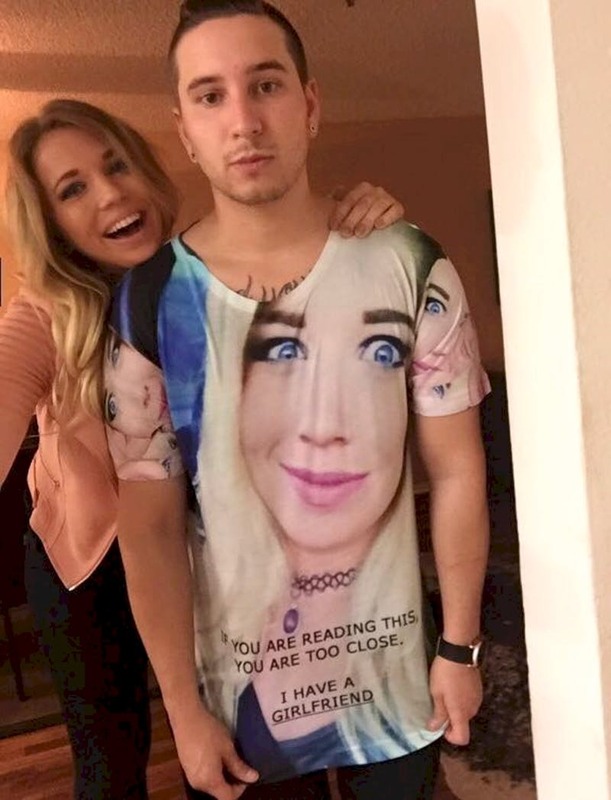 We hope it was all a joke, because if his girl actually wanted him to wear that shirt, then he has a real problem! His facial expression is not just full of disappointment! He looks really scared and he has every reason to be!